SOUTH BRONX — The controversial billboard that rebranded part of the South Bronx as the Piano District has been taken down, but developer Keith Rubenstein is still moving forward with plans to help open a coffee shop, art gallery and design studio in the neighborhood. 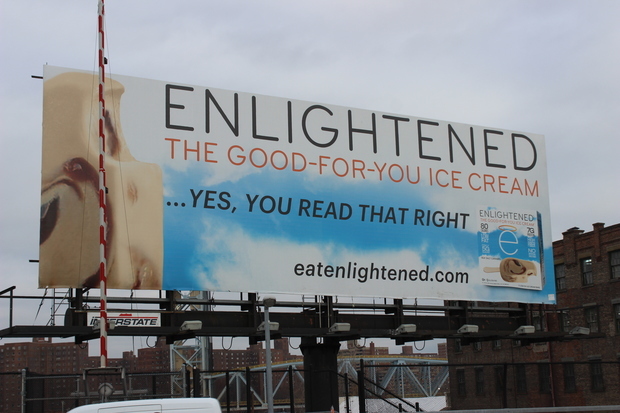 The advertisement by the Third Avenue Bridge and Bruckner Boulevard which once proclaimed that luxury waterfront living and world-class dining would soon arrive in the South Bronx was taken down in response to community concerns and is now hawking Enlightened, a brand of ice cream. The Piano District billboard was extremely contentious, as it embodied many of the fears that South Bronx residents have about gentrification coming to their neighborhood and pricing them out. Locals voiced their disappointment with the sign using the hashtag #WhatPianoDistrict, and the billboard was defaced with three splotches of paint as well. Mychal Johnson, a longtime environmental advocate for The Bronx, said he was happy that the Piano District billboard was no longer up and viewed this as an indication that Rubenstein, founder and principal of Somerset Partners, was listening to community concerns about his plans for the neighborhood and the attempted rebranding of it. He would ideally like to see the billboard replaced with some type of public service announcement dealing with a concern that locals have with their neighborhood, such as air pollution. "For instance, 'Better air, healthier life,' or something like that," Johnson said. Somerset Partners joined together with The Chetrit Group to purchase the South Bronx sites at 101 Lincoln Ave. and 2401 Third Ave. for $58 million, where they plan to build a residential and retail complex. Rubenstein also plans to help open a coffee shop at 134th Street and Third Avenue, an art gallery right next door and a clothing design studio at 41 Bruckner Blvd., all of which should be ready for business in January, according to Tim Black, owner of Development Concepts, the contractor for Rubenstein. The coffee shop comes from the owners of three cafes in Harlem—Double Dutch Espresso, The Chipped Cup and Filtered.Harlem—and the design studio is called 9J and billed as a concept store for emerging designers. 9J will be curated by Jerome LaMaar, whose Instagram profile describes him as a Bronx native and a "glamour-loving mystic." Black said he had not heard any worries about the new businesses gentrifying the neighborhood and that people were eagerly anticipating their arrivals. "I haven't heard anybody say anything of concern. Everybody is excited," Black said. "It's so promising for the neighborhood. I'm very excited to be part of it." Johnson took a more measured approach, saying he hoped that the new businesses would involve the local community by creating good jobs for residents and selling their products at affordable prices. "There’s nothing wrong with more art galleries. There’s nothing wrong with additional coffee shops," Johnson said, "but it should reflect and include the existing culture and existing artists." Sam Spokony, a spokesman for Somerset Partners, said that the company would work to make sure locals were not left out of its projects in the neighborhood. “We are committed to working with South Bronx stakeholders on achieving longstanding community goals, and the creation of good local jobs and local arts partnerships are key to that commitment," he said. "Our wide-ranging vision, which includes new small businesses, new open space, access to affordable food and other benefits, will help to preserve the culture of the South Bronx while providing new opportunities for residents."